Play AVCHD video on next iPhone - iPhone 5S/6S? WinX HD Video Converter Deluxe will help you convert AVCHD to iPhone 5S/6S. iPhone 5S, along with its colored version iPhone 5C, was released in September, 2013, while the latest iPhone 6S and Plus recently comes out in 2015. This generation iPhone 5S runs iOS 7, higher processor and comes with bigger storage. Users can rely on that iPhone 5S/6S should work better as our media center. Just name one of it, playing AVCHD video on new iPhone 5S/6S. Can AVCHD Video Be Played on iPhone 5S/5C? Theoretically speaking, no. It is no secret that Apple iPhones only support a limit type of video formats: MOV, MP4 and M4V. AVCHD can't be played on iPhone 5S/5C directly. It must be transcoded to iPhone compatible formats. But in technical term, if you have a sound HD video converter which supports converting AVCHD to iPhone 5S/5C, all problems will be solved immediately. WinX HD Video Converter Deluxe is such a video converter. It can flawlessly convert AVCHD to be playable on iPhone 5S/5C and allows you to watch AVCHD videos on new generation iPhone on the go. Besides, it also permit you to convert AVCHD to popular devices, such as converting AVCHD to iPad, iPod, Android phone/tablet, WP8 phone/table, PSP, etc. With the in-built 370+ video audio codes, WinX HD Video Converter Deluxe will be your best assistant in converting videos from one format to another, say, AVCHD to MP4, AVCHD to AVI, AVCHD to WMV, MPEG, FLV, H.264, and so on. How to Convert AVCHD to iPhone 5S with AVCHD to iPhone Video Converter? 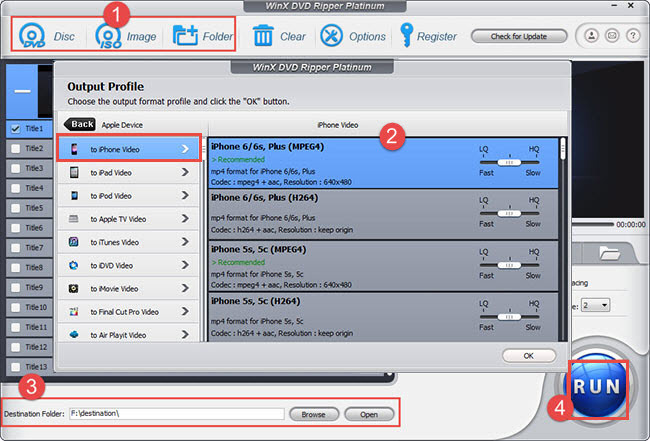 To start converting AVCHD to iPhone, you need to firstly download WinX HD Video Converter Deluxe and install on your PC. Step 1: Launch this AVCHD video converter for iPhone 5S/6S. Load source AVCHD video by clicking "+Video" button or simply drag and drop files to add. Step 2: Choose output video format/device under Ooutput Profile Category. To convert AVCHD to iPhone 5S/5C, we follow: Device Profile -> Apple Device -> to iPhone Video -> iPhone 5S, 5C. As you can see from the interface, with WinX HD Video Converter Deluxe, you can convert AVCHD to iPhone 5S/5C MPEG4 or H.264 file. Note: iPhone 7, Plus options is available since its releasing. Step 3: Choose a Destination Folder to store the converted AVCHD video. Tips: By doing this, you can sync the converted AVCHD video to iPhone 5S/5C or play it on other video players whenever you wish. Step 4: Click "Run" and go. It will take a moment to finish converting AVCHD to iPhone 5S/5C. With WinX HD Video Converter Deluxe, playing AVCHD video on iPhone 5S/5C will be as easy as ABC. Play AVCHD on iPhone - How to Play AVCHD on iPhone 8/7/6S (Plus) with OLED or Retina (HD) Display. Convert AVCHD to M2TS - Convert AVCHD to M2TS for playback on M2TS video players. Convert AVCHD to Android - Convert AVCHD to Android phones and tablets with fast speed and remarkable quality. Convert AVCHD to iPad - Convert AVCHD MTS to iPad and watch camera HD MTS video on iPad 4/Mini. Convert HD Video to iPhone 5: Convert HD videos for iPhone 5, play HD video on iPhone 5. Convert MKV to iPhone - Convert MKV to iPhone iPad iPod touch, play MKV on iPhone iPad iPod touch. All-round video software which is able to convert all HD and SD videos. Independently convert between MKV, AVCHD, M2TS, AVI, MPEG, MP4, MOV, WMV, Google TV, WebM, Vpx8, etc. Convert and transfer various videos to iPhone, iPad, iPod, PSP, PS3, Xbox, Android, WP8, Mobile phone, etc. It also can download YouTube/Dailymotion/Facebook videos, make picture slideshow, and merge/crop/trim/subtitle videos, etc.